Diabetes Care Club, a social network connecting diabetics from across the country, offers free online cookbooks filled with diabetes-friendly recipes. Available for download at www.diabetescareclub.com/diabetes-cookbook/, the recipes show your patients that meals don’t have to be bland just because they’re diabetes friendly. 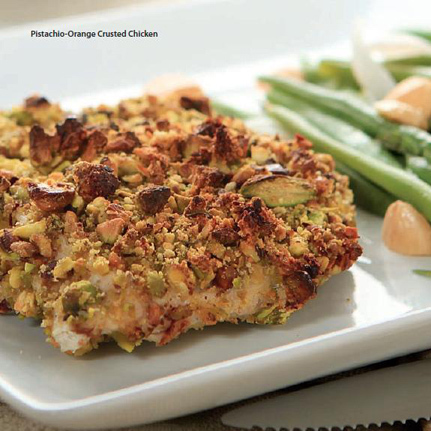 Below are appealing recipes for a Broccoli Cheddar Omelet and Pistachio-Orange Crusted Chicken that you can share with your patients. Find these and other interesting recipes in the online cookbooks from the Diabetes Care Club. Additional free recipes and meal plans are available for your patients at the Diabetes Care Club website. Yield: 2 servings; You can make this as one large omelet and cut it into two servings or make two in smaller skillets. 1. Strain most of the sauce from the broccoli into a medium bowl. To the sauce, add the egg whites, dill weed, salt and pepper, and beat until combined. 2. Return the broccoli to the plastic container and stir in the Worcestershire sauce. 3. Melt the butter spread in a 10-inch nonstick skillet to coat the bottom. When hot, add the egg mixture. Cook over medium-high heat, lifting the edges with a spatula while tilting the skillet to let the uncooked portion flow underneath. When the top is only slightly runny, slide the omelet onto a dinner plate, and then return it to the skillet, flipping it over to cook the top. 4. 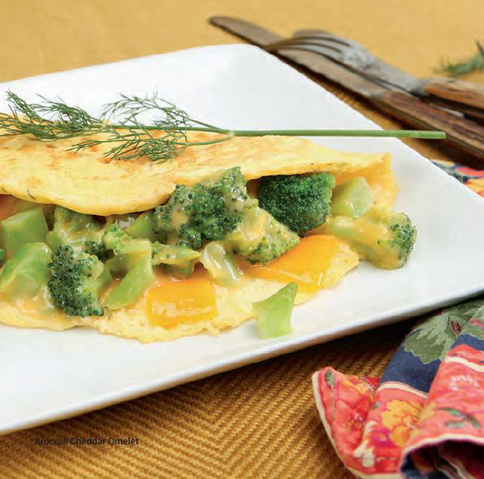 Lay the slices of cheese in the center on the top of the omelet and top with broccoli. Fold the omelet in half over the filling. Slide onto a plate, and cut in two. 1. Preheat the oven to 425˚F. Place a wire cooling rack or other type of cooking rack on a baking sheet; set aside. 2. Place the chicken breast half between 2 pieces of plastic wrap. Using the flat side of a meat mallet, pound the chicken to π-inch thickness. Season the chicken with the salt and pepper. Cut the chicken crosswise in half. 3. Place the nuts and panko in a food processor container. Cover and process with on/off turns just until the nuts are finely chopped. Transfer the nuts to a shallow dish or pie plate. Stir in the orange peel and thyme. 4. Place the beaten egg white in another shallow dish or pie plate. Dip the chicken pieces into the egg white, then into the nut mixture. Coat both sides of the chicken with the nuts. Place the chicken on the rack on the baking sheet. 5. Bake the chicken in the preheated oven for 14 to 18 minutes or until an instant-read thermometer inserted near the center reads 165˚F. Recipes and photos are courtesy of the Diabetes Care Club and are among those found in their cookbooks.